When it comes to pedestrian accidents, children and the elderly are most at risk. North Georgia personal injury lawyers have been following a move by the National Highway Traffic Safety Administration, which initially planned to mandate the installation of backup cameras in new vehicles by 2013. Descent from the auto industry has left that plan in limbo. Yet we have to do something with our cars because we have done so little to improve our roads. 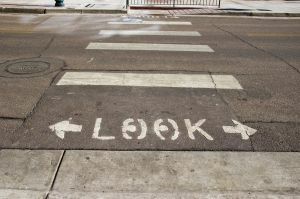 Transportation for America reports almost 50,000 pedestrians were killed in the United States during the past decade. That's the equivalent of a jumbo jet crashing every month! Nearly 700,000 were seriously injured. Somewhere in America, a pedestrian is struck every 7 minutes. Yet little attention and even fewer resources have been focused on reducing these preventable accidents. Nationwide, just 1.5 percent of highway funding is geared toward pedestrian safety, despite the fact that 12 percent of fatal crashes involve pedestrians. In most instances, roads are build for cars, with little thought for pedestrians. And Congress is considering a move that would push the obligation onto states by reducing or eliminating what current federal pedestrian safety funding exists. Meanwhile, the National Highway Traffic Safety Administration reports 4,092 fatal pedestrian accidents were reported nationwide in 2009; another 59,000 were seriously injured. Georgia pedestrian accident claimed 150 lives that year. About 20 percent of fatality victims were over the age of 65 and another 20 percent were between the ages of 5 and 9. Children under the age of 15 accounted for about 25 percent of all injury victims. Many of the injuries involving children are the result of backover accidents. "Every year, nearly 300 people are killed and 18,000 more are injured when someone, often a parent or grandparent, backs over them," said Transportation Secretary Ray LaHood. "To put an end to these tragedies, we have proposed a new safety rule and are seeking further public feedback." The proposed rearview visibility rules are part of the Cameron Gulbransen Kids Transportation Safety Act of 2007. It would have required 40 percent of cars to have rear-mounted safety cameras by 2013 and all new cars to come standard with the equipment by 2014. The NHTSA estimates 100 lives a year could be saved. However, as Car Connection reported earlier this year, the government agreed to delay the new rules after a meeting with auto industry representatives. For its part, Transportation for America is pushing for better road design and more funding. The organization's "Dangerous by Design" report puts focus on retaining dedicated federal funding for bicycle and pedestrian safety, adopting a national policy for complete streets, and filling in the gaps in communities that lack sidewalks in certain areas. Meanwhile, motorists have an obligation to watch for pedestrians. Please remember that pedestrians typically have the right of way -- even when not in a crosswalk. Failure to yield to a pedestrian can result in a serious or fatal accident. If you are injured in an accident, contact the North Georgia Personal Injury Attorneys at The Law Office of Casey W. Stevens. Call 877-217-7230 for a free case evaluation. Serving all of North Georgia, including Dawsonville, Suwanee, and Woodstock.